In June 2018, after a years-long process, the Washington State Supreme Court ruled that the legislature successfully reflected and upheld the conditions set by the McCleary decision — a state Supreme Court ruling that decreed that the state must completely fund basic education in order to lessen the funding gap between schools caused by the success of different local levies. This decision led to an increase in state funding for public schools, but it also impaired some districts financially due to limitations set on funding percentage allowance from local levies. Amid budget shifts and cuts, a state-wide push for salary and contract negotiations occurred among teachers, administrators, and Vashon Education Support Personnel (VESP) staff members — unlicensed staff who are employed and trained to perform specific jobs within the district, such as lunch monitors, office workers, and paraprofessionals. In the Vashon Island School District (VISD), staff negotiated a 10-percent raise for teachers and a three-percent raise for principals and assistant principals. However, VESP negotiated their contracts over a much longer period of time — from March through mid-October, with a month-long break in July — in order to fight for a “living wage.” Many of the 42 VESP in VISD are not full-time employees of the district and are accordingly paid on an hourly basis. The final salary increase for VESP will be implemented over the next two years, with a 16 percent increase this year and 4 percent the following year. The school board unanimously approved the change at a board meeting on Thursday, Oct 11. Prior to the recent negotiations, a VESP starting salary in 2017-18 was $13.45 an hour for newly-employed paraeducators, with the highest hourly wage being $31.02 for a Math Support Coordinator with 18 years of experience in the district. With negotiations finished, starting salary for paraeducators has been raised to $18.94. According to the Council for Community and Economic Research, in 2017, the cost of living on Vashon was cited as 27 percent higher than the state average, making it substantially more difficult to live in close proximity to work. Inversely, before negotiations, VESP were the lowest paid of any school district in King County before negotiations. Low wages — and the lengthy wage negotiations that occurred as a reaction — lowered the overall morale of the environment in which VESP worked during the months of the negotiations. Feelings grew strong. Many members of the VESP understood that the budget is limited, but many also believed that given the essential role they play in the district, they should be better compensated for their work. 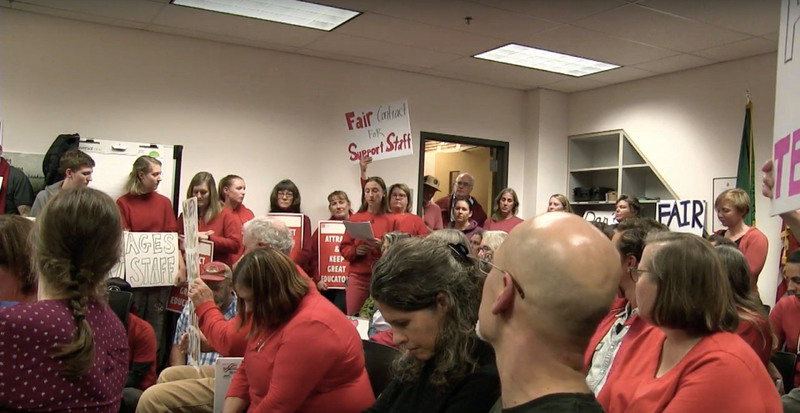 VESP members and supporters of the proposed wage increase filled school board meetings on Sept. 13 and 27, reading emotional letters about their love for their jobs and how the low salaries impacted their working and living conditions. They also rallied on island streets and protested the low wages on Chautauqua’s Curriculum Night. Before the negotiations were concluded, according to staff interviewed, many VESP had to leave their jobs because they simply could not afford to live on the island, often even with the supplement of a second salary. Merrill explained the crisis staff were facing. It was a difficult situation for everyone involved. The frequent changes in staff caused by the low wages were hard to manage, not only for the district, but also for the students that the VESP work with. The new contract addressed a critical need among the VESP staff: the need for recognition for what they do. The staff members working in these jobs have the difficult task of working with students who have severe developmental delays, yet they find their jobs deeply rewarding. According to staff interviewed, VESP fought for a raise in order to be able to continue working because they truly believe in the impact they can have on students lives when they build relationships over long periods of time. “It’s hard work … from getting physically assaulted or verbally assaulted [to] dealing with some pretty heavy issues in children’s lives,” Merrill said. VESP began their negotiations for higher wages in March 2018, represented by Mary Reeves, Elizabeth Parrish, Susan Bakker, Kathryn Hall, Heather Baldwin, and Torian Hodges-Finch. Amy Sassara, Rebecca Goertzel and Kathryn Coleman represented VISD (Superintendent Slade McSheehy represented the VISD negotiating team beginning on Sept. 19). VESP was negotiating for a 23 percent salary increase, which would have added an additional $292,000 to district expenses. As a counter offer, the district offered a 12.5 percent raise, which would have added a total of $165,031 to district expenses. Although they always kept budgeting priorities and fiscal sustainability in mind, the district always planned on giving the VESP a raise throughout the negotiations according to McSheehy. The McCleary decision designated $2 billion to education funding for Washington state, $2.5 million of which was allocated to VISD. The decision also put a cap on how much funding districts can raise through local levies. This resulted in a $700 thousand decrease in VISD levy funds, which impacted the salary negotiations on the district’s side and factored into the financial consequences of the VESP raises. For example, the state pays the wages of 80 of the districts certified staff — teachers and counselors — but the district employs 100. The extra 20 are funded through levy funds. The district is still in the process of figuring out the complete impact that the levy cap resulting from the McCleary decision will have on the budget. Throughout the negotiations, a difference in opinion among VESP and VISD negotiators primarily occurred as to where the McCleary money was designated to go. While the general implication of the legislature was that the money should go towards salaries, there was no language in the decision that explicitly said this was the case. Despite this, VESP argued that $566,000 of the state funding was designated for classified employee salaries — which include VESP and Service Employees International Union members. This number is based on the Prototypical Schools Staffing Model suggestions for the district. This model is a state suggestion of how to allocate money based on factors including district features such as size, regional population density, and student household income. The model suggestions aren’t a requirement for allocation of district funds, merely a general outline. One of McSheehy’s goals in his future as superintendent is to dedicate time to spend with all district employees to make sure that they know their work is valued by the district.